Appealing to sports and action photographers as well those who use the immensely versatile range for portraits, the Tamron SP 70-200mm f/2.8 is a rightly popular lens. Invariably though it’s a pricey option, especially with built in ultrasonic type AF motors, weatherproofing and image stabilization. Until recently, more affordable models lacked some or all of these features. 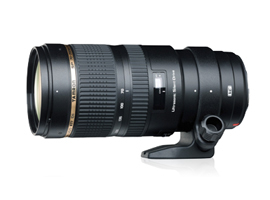 However, while the new Tamron SP 70-200mm f/2.8 Di VC USD sees a substantial increase in price (up from $770 from the non-VC version to $1,699), it’s still more accessibly priced than the Nikon (or for that matter the Canon) versions. 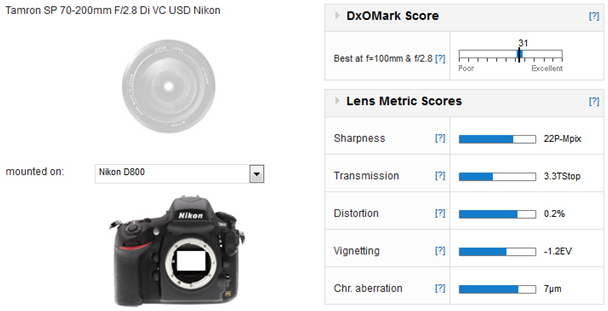 Achieving a very high 31 points on the overall DxOMark Score, when mounted on the Nikon D800, the Tamron 70-200mm f/2.8 VC is the highest rated of its type yet featuring a Nikon mount. It’s not just control of distortion and CA that account for this lens’ lofty ranking, but it can also boast the highest sharpness score of any 70-200mm mounted on a Nikon D800. Both the transmission and vignetting scores are as expected for this type of lens. If there’s a shortcoming at all, it’s that the performance varies a little over the focal range (indicated by our DxOMark Score gauge). 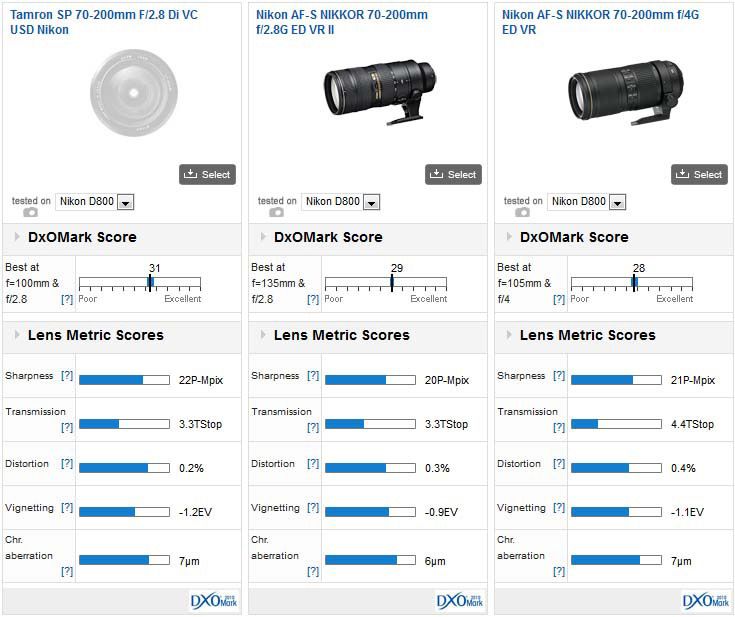 No one can say the Nikon lenses don’t perform well optically, they do, but the Tamron has the highest Sharpness score (while maintaining similar levels across the field as the Nikkors) and more or less matching them on the other metrics. Vignetting, while still an important consideration in lens design, is really not as problematic to users as it was during the film era. As a ‘fast’ (f/2.8) zoom with VC and USD (ultrasonic type focusing), the Tamron appears to be good value, costing around $1000 less than the Nikkor version. However, the Nikon 70-200mm f/4G ED VR performs nearly as well for $300 less and while the maximum aperture is ‘slower’, weight savings of 620g are not to be ignored (and may make all the difference between using the lens or not). If you want the sharpest 70-200mm for your Nikon D800 though, the new Tamron VC version is the lens for you, but lens choice is never usually that simple.